Scared Straight: Foot X-Rays that will scare you into better shoes. I wanted to talk about why having a shoe with a thick rigid sole is so crucial for proper foot care. I have a patient who was kind enough to give me permission to use his story and his x-rays. He is a healthy thirty-something year old man who had a horrible motorcycle accident nine years ago. When I walked in the exam room, I immediately noticed that his complexion was grey and he looked like he was going to vomit. We talked and he told me that the last time he saw a Podiatrist he was told that he might need an amputation. I quickly eased his fears by telling him that we would only be talking about shoes and inserts and that we should be able to greatly improve his foot by making some simple, non-painful, non-surgical changes to his current shoes and inserts. He said that three days ago he was walking and heard a ‘pop’ and felt a pain in his right foot. He stated he didn’t have any specific injury but was simply walking. I checked the shoes that he had been walking in and they had an extremely thin, flexible sole. 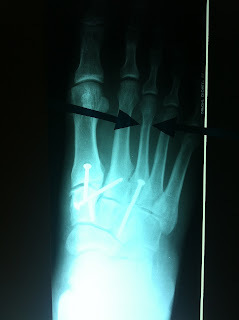 The three screws were placed across his Lisfranc’s joint after the motorcycle accident. On the day of the accident, he was wearing a shoe with a flexible sole and, when his foot twisted, multiple bones were broken in the midfoot area and ankle. 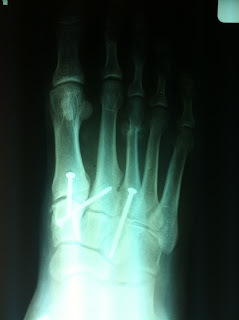 The surgeon had to perform a joint fusion by placing screws across the Lisfranc’s joint. The idea behind this is that if you fuse the joint – you stabilize the joint, limit motion and thereby limit pain. Since the accident, he’s always had some degree of foot pain but has managed to stay active. After the surgery, he didn’t realize that he needed to stop walking barefoot and wearing flip-flops and that, after an injury like this, he needed to limit himself to shoes with a thick rigid sole for maximal protection. Not knowing this, he spent the last nine years wearing improper shoe gear. If you look closely, can you see that two of the three screws are broken? The two that are most vertical are the broken screws and, unfortunately, it is harder to see that the one on the right is broken in half – but it is. My point being, if nine years worth of walking barefoot and wearing flip-flops causes enough stress through the Lisfranc’s joint to break two titanium screws – what is all that stress and strain doing to your joints? The strange part of this story is the problem is not the broken screws or the Lisfranc’s joint. The problem is that he was wearing a flimsy sole shoe and the one titanium screw that is intact and doing it’s job of limiting motion across the joint was not allowing any motion and his body needed motion to walk. The stress on his foot was too much and his body found the motion he needed by breaking the third metatarsal. Take a look at the arrows. The real problem – the thing that is currently causing him pain – is the new broken bone on the third metatarsal. We placed him in a below-the-knee walking boot for two weeks and had him come back two weeks later for x-rays. Two weeks later, the third metatarsal fracture is more easily visualized because it is forming a ‘bone callus’, which is the body’s way of trying to heal itself. And he should be able to lead a normal, healthy, active life! The moral of the story is: protect your feet!